So my late-summer turkey craving needed a side kick, or side dish I guess. Enter: savory rice. I have read about the many health benefits of both brown and white rice, and I cook same as I vote: straddling the fence with compromise in mind. 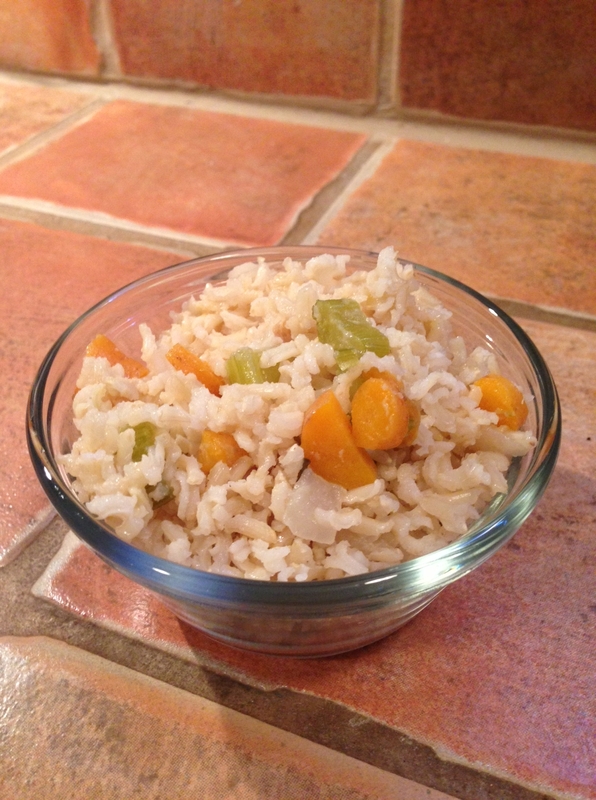 We’ve had white rice a few times recently so I decided to go with brown for this recipe. I chose wisely. It was super tasty and just the right partner for my September turkey–savory and rich tasting, but not too heavy as it’s still warm ’round these parts. Ingredients: 2-3 tbsp. olive oil, 1/4 chopped onion, 2 cloves pressed garlic, 1 cup diced carrots, 2 stalks of celery diced, 3 cups brown rice, 6 cups chicken broth. Tip: This is a ton of rice, even for my hungry crew. All part of my master plan as two days later I put it all together and made turkey soup! Wanna know more about that? I’ll tell ya soon. Promise!